Francis Marion WILLINGHAM3(Alfred2Archibald1) was born 13 Jun 1861 in Washington County, Texas, USA and died 29 Oct 1898 in Caldwell, Burleson County, Texas, USA. He married 25 Mar 1886 in Lee County Texas to Sarah Ann JONES (obit) who was born Feb 1868 in Texas. The couple moved to Oklahoma. 1 i. Minnie WILLINGHAM4(Francis3Alfred2Archibald1) was born Nov 1883 in Washington County, Texas, USA. 2 ii. Ollie Frances WILLINGHAM4(Francis3Alfred2Archibald1) was born 6 Feb 1887 in Brenham, Washington County, Texas, USA and died 27 Sep 1971 in Bryan, Brazos County, Texas, USA. She is buried in the Giddings City Cemetery in Giddings, Lee County, Texas, USA cemetery next to her husband Joseph H. HELMER. 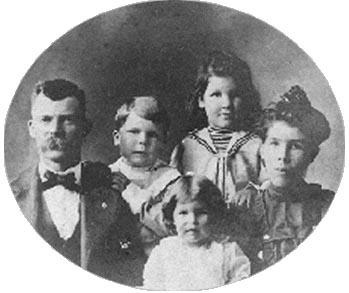 Ollie and Joseph married 24 Dec 1901 in Lee County, Texas, USA. iii. Francis Marion WILLINGHAM, Jr.4(Francis3Alfred2Archibald1) was born 27 Oct 1890 in Lee County, Texas, USA. iv. Beulah WILLINGHAM4(Francis3Alfred2Archibald1) was born Jun 1899 in Lee County, Texas, USA. ¦ Francis Marion was killed in a wood yard in Caldwell, Texas, USA while fighting in a pistol duel. ¦ John Pickney Black, Sr. m. 1st to Miss Sarah Wilhelm of Milam County, Texas, USA. ¦ He m. 2nd to Miss Elizabeth Adeline Moore, a close neighbor. ¦ He m. 3rd. to the widow Mary C. Jones.